Our process is one you can rely on. Let us be your trusted guide and help you succeed. At Reid Engineering we know that you want to be a confident Owner, Executive or Engineering/Environmental Manager who has made the right decision for your company. In order to do that, you need a wastewater treatment system that meets or exceeds Local, State and Federal Government Regulations. The problem is that these government regulations are always changing but yet you still have to comply with them. This can make you feel frustrated, worried and somewhat alone in a complicated planning, design and permitting process that is hard to fully understand and navigate. We are here for you, to help you, to guide you and even to take over full responsibility of your project. We believe that Government regulations shouldn’t prevent you from building a cost effective wastewater treatment system. We understand how intimidating your wastewater projects can be. That’s why for over 40 years we have helped hundreds of companies across the country efficiently comply with government regulations. 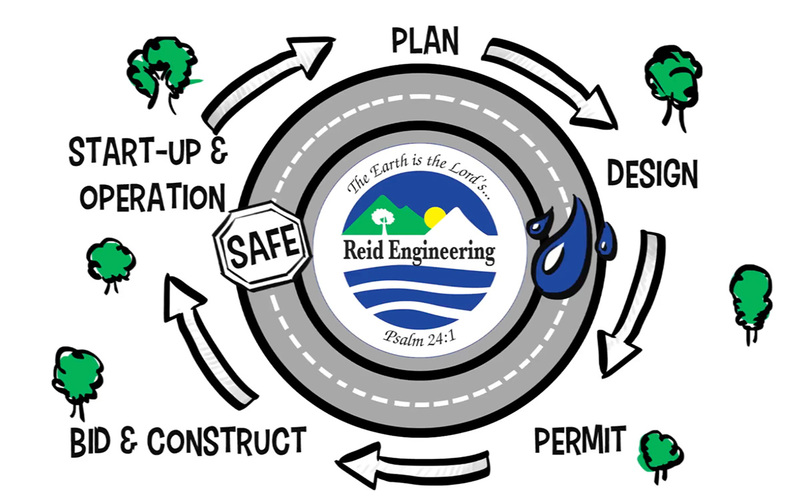 At Reid Engineering, we exist to serve and guide you throughout the entire project lifecycle. Our goal is to provide you with cost effective and compliant engineering solutions. Rest assured. We have it covered! Contact us today. Meet with our team of dedicated engineers and designers to discuss your specific project needs. Meet with our team of dedicated engineers and designers to initiate a preliminary evaluation of your project. We provide full drawings and specifications that are compliant and cost effective for permitting and construction. After the design and permitting is completed our team assists you during the bid and construction phase and the start-up/operation phase of your new system. We will handle all the details while keeping you informed at every step of the project lifecycle. Schedule a Consultation today or view our latest projects in our gallery. With Reid Engineering you can finally stop wasting time and money and instead be the one to get your Company ahead of the Game.